Chit Phoo Wai was our first sponsored child, who had been sent to the local monastery by his mother because his father had died, and she could not afford to feed him or send him to school. He missed three years of education. At 10 years of age he was sponsored, and on leaving school, went to a 5 star hotel for work experience, and was then offered a job at reception. He has just completed his first year there. On his day off he helps at the Vera Thomson English school. We have some very bright children from extremely poor families who now speak good English and have taken on responsibilities in the Vera Thomson School. May Lay Myint, whose father is dead, and whose mother works so hard to feed her and her grandmother, is now Head Prefect and is the keyholder, and opens and closes the school daily. Two older children are in charge of teeth cleaning, and another two in charge of keeping the school and grounds clean and tidy. They also help with the younger children, and translate when necessary. 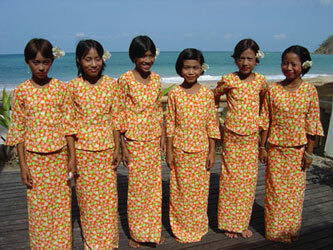 Children were taught to sing, dance and play recorders for the Thingyan festival (Myanmar new year). Daily rehearsals took place until the performance was perfected. The children performed on two stages in Lintha village, and four stages in the local town Thandwe, which is six miles away. Some of the children had never been to town before. The father of Hla Hla Pyone had bone cancer, caused by falling from a coconut tree, whilst working nine years previously, and injuring his foot badly, but could not afford treatment. The Andrew Clark Trust was able to pay for two operations, the last one being an amputation. This saved his life, and now that he has a false leg fitted, he is able to continue being a trishaw driver and earn a living. A mother who had two children die of dengue fever, and three children drown, had a baby of 9 months old who had pneumonia, and was extremely sick. The Andrew Clark Trust was able to pay for a taxi to the local hospital (there were no buses as it was after 6pm), and pay for the child to be admitted to hospital, where he was given oxygen and medication. The child's life was saved. 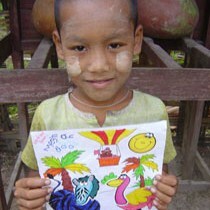 Min Zaw Htwe aged 10 years was born with a disabled foot, and was not able to walk properly. The Andrew Clark Trust was able to pay for his operation and he is now able to walk normally, and can therefore now go to school. Nu Than Khin, aged 12 years, had malaria and her parents had no money to pay for a blood test and medication. Without the malaria treatment she would have died, but the Andrew Clark Trust was able to pay for this. Jolly Swe, who was 9 years old, had to drop out of school as he had to look after his 2 year old sister, while his parents were out working. His sister could not walk and it was found out that it was through malnutrition. The Andrew Clark Trust paid for vitamins and mineral supplements and she is now walking well, enabling Jolly Swe to return to school. 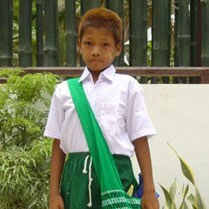 Zaw Min Oo, aged 9 years old, had a dislocated shoulder and was in a lot of pain. We took him to the doctors, who put the shoulder back in its socket, and the boy was given pain killers. After a few days he was fully recovered, and was able to use his arm again. 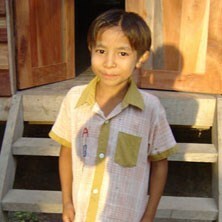 Had we not have taken him to the doctors he would have lost the use of his arm, as his mother could not afford to pay.